Superior Court Judge Kelvin D. Filer. Photo by Ben Balagot. SANTA CRUZ, CA--As a Superior Court Judge in the Southern California city of Compton, Kelvin D. Filer sees more than his share of cases involving murder, drugs, and gang violence. As a product of the same neighborhood, Filer is a powerful role model who has devoted himself to "reaching out and helping others as I've been helped." The public is invited to a free talk on Monday, March 12, during which Filer will address the topic, "What is Our Legacy?" The talk, which will begin at 7:30 p.m., will take place in the Colleges Nine and Ten Multipurpose Room at UC Santa Cruz. Today's youth suffer from what Filer calls "cultural amnesia." "It's like young people have forgotten--or were never taught or exposed to--all those people who came before us who had much more difficult problems, and they didn't let those problems stop them," said Filer. "It's particularly true for youth, especially African American youth." Filer is a popular public speaker in Compton elementary and high school classrooms, where he encourages young people to stay in school and prepare for college. "I think we need to do a better job explaining the value of education, especially among students of color," he said. "All of us have that obligation. As I always say, I may not be able to change the world, but I want to help change my corner of it." Filer, a 1977 graduate of UCSC, is returning to campus to accept the second annual Distinguished Social Sciences Alumni Award. "Through his work on behalf of the city of Los Angeles and the state of California, Judge Filer has made exemplary contributions to society," said Sheldon Kamieniecki, dean of the Division of Social Sciences at UCSC. "He brings enduring honor to UC Santa Cruz, and we are pleased to recognize his dedication as a judge, his volunteer efforts in public schools, and his years of positive community involvement." Filer was the unanimous choice of the committee of three faculty members, three alumni, and two students who reviewed nominations submitted by faculty, staff, and alumni. The first award was presented last year to Dana Priest, the Washington Post reporter who won a 2006 Pulitzer Prize for breaking the story about the CIA's secret overseas prisons. Filer grew up in the Compton neighborhood during the 1960s and attributes much of his success to his parents. "Higher education was not an option in my family, it was expected," said Filer, who earned a B.A. in politics from UCSC and graduated from UC Berkeley's Boalt Hall School of Law. He worked in the state Public Defender's Office in Los Angeles before entering private practice in Compton. 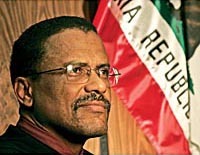 He moved to the bench in 1993 and was named to the California Superior Court in 2002 by then-Governor Gray Davis. A high-resolution photo of Kelvin Filer is available here.